The students themselves did not respond and went to take their seats. When they got off they phoned Dan’s service center to complain, and also reported the incident to the bus conductor at the station by the university. Nasrin pulled on her long black abaya and pinned her hijab in place. She did it despite knowing that this day, more than ever, her Islamic dress would make her a target. It was the Tuesday morning after the Sydney siege at the Lindt cafe in Martin Place and Australia had woken to horror headlines of the death of two hostages. While Nasrin grieved for the victims, she also steeled herself for the worst. As she left her house in the outer Melbourne suburb of Fawkner, she decided that she would remove the password lock from her mobile, to save her a few seconds if she needed to call police. Sure enough, the mother-of-three would later dial triple zero after a man allegedly began shouting expletives at her as she travelled into the city to work. More than a week later, the police investigation remains ongoing after a 40-year-old Merlynston man was spoken to and released. Since October, the IT professional says she has been abused three times by strangers who have taken offence to her Islamic dress. Two of the episodes took place on the Upfield train line during or shortly after the fatal cafe siege. The other was in October, when Nasrin, who wished to use just her first name, said some politicians were advocating banning the burqa in Australia, fuelling anti-Islamic sentiment. There has recently been a surge in reports of violence and harassment against Australian Muslims. In the six days to Tuesday there were 27 reports made to the Islamophobia Register, including at least three in Victoria. The register’s spokeswoman, Lydia Shelly, suspects there may be many other cases that have gone unreported. She said the majority of public attacks were against women and often in the presence of children. A large majority of citizens is apparently in favour of introducing a nationwide ban on burqas for Moslem women in Switzerland according to an opinion poll. More than 60% of respondents said they would outlaw the Muslim religious garment in public spaces, says a survey by the Léger Switzerland polling institute. The SonntagsBlick newspaper says people of all age groups and both in the German- as well as in the French-speaking parts of the country would vote for a ban. About one in three respondents are apparently against it. 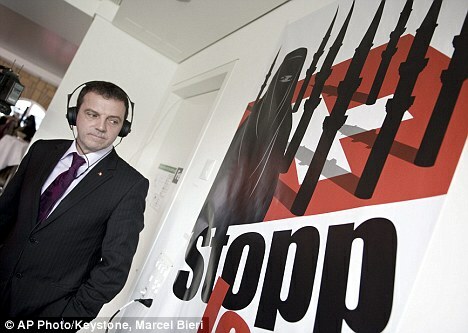 A member of the rightwing Swiss People’s Party [Walter Wobmann, pictured] is planning to launch a campaign next year for a nationwide vote on the issue. The Westdeutsche Allgemeine Zeitung reports that a Muslim woman of Syrian heritage was verbally and physically assaulted by four racists in the city of Braunschweig in Lower Saxony last week. The 29-year-old woman, who was identifiable as a Muslim because of her headscarf and dress, was struck on the knee by a car while crossing the road. Four men, who were said to be in their early 20s, got out and proceeded to subject her to anti-Islamic abuse, while one of them grabbed her by the collar of her jacket. At that point passers-by intervened and shouted at the men, who got back in the car and drove off. Police have appealed for witnesses to contact them. Seven Orthodox Jewish groups, a Muslim civil rights organization and a public interest law firm supporting religious freedom filed briefs this week with the U.S. Supreme Court supporting a Muslim teenager who was denied a job at Abercrombie & Fitch because she wore a head scarf. Samantha Elauf was 17 when she was rejected by a Tulsa, Okla., branch of the clothing store. Employees acknowledged that she was turned down because her scarf didn’t meet the company’s “look policy” that requires its sales staff to be in keeping with its “classic East Coast collegiate style of clothing,” according to court filings. The company said its employees did not know she wore the hijab for religious reasons. “It is important that these Orthodox Jewish groups express support for this Muslim woman who has had a similar experience,” he said. 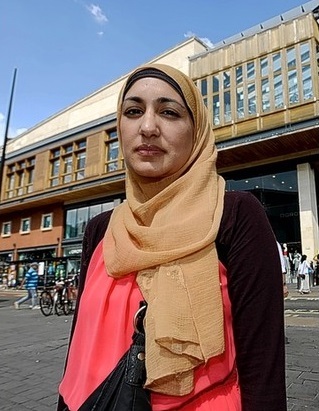 A Muslim woman who was spat at during a racist rant in Cabot Circus has spoken of her shock at the people who turned a blind eye. Jack Hughes, 26, of Upton Road, Bristol, was fined £336 for assault at a court hearing this week for his attack on Hasina Khan. As reported by the Bristol Post when it happened in July, Hughes spat on her hand and hijab head dress while launching into an Islamophobic rant. Hasina issued an passionate plea for help to track down the perpetrator through this newspaper. Following his conviction, which includes 120 hours of community service, she said: “It is my body and if I chose to cover it that’s my decision. There are lots of beautiful women who chose to cover their bodies and they should not live in fear of being attacked. “What is frightening is that a small woman was attacked by a male in broad daylight in a public place, there were many onlookers who turned a blind eye and who did not even approach the woman to ask if she was okay. That is a very bad snapshot of society. A 60-year-old Muslim woman was seriously injured after being attacked at a bank in Vienna, in an incident which appears to have been motivated by Islamophobia. Pensioner Selver S. was waiting in a queue to collect her pension at a Bawag bank branch in Schönbrunner Strasse (Meidling) when a man approached her, insulted her and repeatedly shoved her, knocking her to the floor. She was taken to hospital, suffering a spinal injury. A 40-year-old man was arrested outside the bank shortly afterwards. 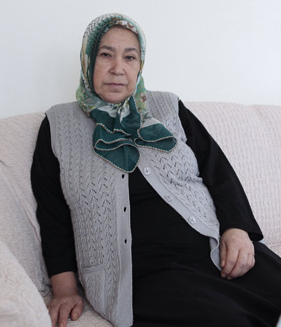 Her son Engin told the Heute newspaper that she suffered a lumbar fracture and had to spend seven days in Hanusch hospital. She had to have an operation on her spine and is now being cared for at home by her son. A regional official of Germany’s ruling CDU has demanded a ban on burkas in public places. The Rhineland-Palatinate official has reasoned that the veil is more a sign of suppression of women than of religious diversity. 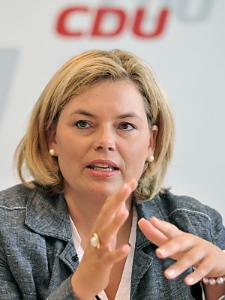 On Monday, Julia Klöckner, deputy chief of Chancellor Angela Merkel’s Christian Democratic Union (CDU) in Rhineland-Palatinate, spoke in favor of banning the burka, a head-to-toe veil worn by women in some Islamic cultures that covers the whole body other than the eyes. She told the German newspaper Rheinische Post that, for her, burkas “did not stand for religious diversity, but for a degrading image of women.” She said that the German constitution emphasized that women and men were of equal value and that “looking at people’s faces” also belonged to the culture of an open society.